Sun, sand and sea are free. 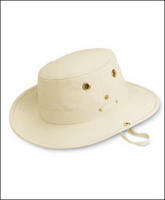 But what makes them more enjoyable is one of my more extravagant purchases of recent years, a Tilley hat. The $60 price tag made me gasp when I picked it up. Could I have been equally as well protected from the sun by any of a million free promotional baseball caps, or the straw hat I bought at Woolworth's years ago for $1.00? Probably. But it just wouldn't be the same as having this nice hat that actually fits and won't blow off. And it's so great that the grommets are rust-proof! And someday it will come in handy that I can store stuff in the pocket inside the crown. And I know I'll meet other fascinating travellers who are wearing Tilleys, and they will invite me to dine with them in St. Tropez. We'll eat fine foods and drink fine wines, and afterwards probably all die when we drive our convertibles off those winding Cote d'Azur roads. you really cannot beat rust-proof grommets. All the cool kids have them.